Mike enjoys fishing for big native brook trout in the ponds, lakes, rivers, and streams of Newfoundland. He has found these trout to be quite responsive to his innovative fly designs. His love of the "brookie" has taken him on excursions for over-sized trout in other parts of Canada, particularly Labrador. 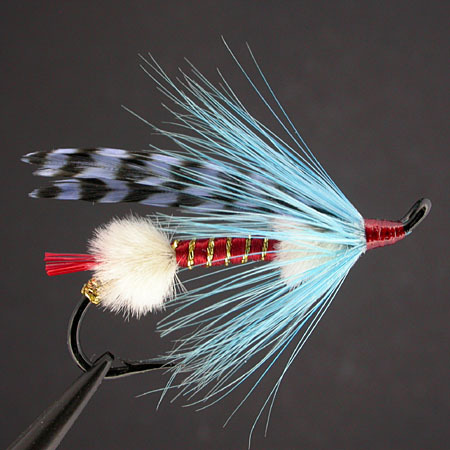 The American Garmic (name derived from MIChael GARnier) is one of a series of flies I have designed. It has some similarities, as you can see, to the original design, the Island Garmic. But I also believe it stands on its own merit. After the events of September, I felt compelled to design a fly that would be strong in standing as a symbol of the American spirit, and something that accurately represents what I feel to be the best representation of what it is to be an American: strong and generous, spirited and above all free. I think the American Garmic looks free spirited and clean, nothing overdressed, in its design and construction. The red, white, and blue shines through, just like the galant patriotic spirit of the people of the United States. I think both Garmic patterns are of sound design and are a little different in the offering they give as flies. Oddly enough I feel the Island Garmic represents the Rock so very well, which incidentally is a nickname given to Newfoundland.